With ‘la récolte’ meaning ‘the harvest’ and le deuxième being ‘the second time,’ the band’s name and CD title tie together perfectly. La Récolte’s second harvest is much more abundant and sonically fruitful than its budget-constrained 2013 debut, thanks to recording engineer Joel Savoy who skillfully captured the band’s buoyant dance hall sound. 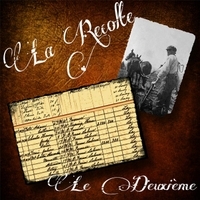 Just as La Récolte realizes that seeds were planted by those who came before it, the group also plants seeds of its own with four band originals. Three were written by Bellard while a fourth, a zesty theme song “La Récolte Two-Step” was co-written by Bellard and drummer Chris LaFleur. Bellard’s most poignant offering is “La Valse de Petite Fille,” a fatherly devotion to a daughter, starting at birth and ending at marriage. With this harvest in hand, La Récolte’s future looks fertile.